Choosing the best all-purpose floor cleaner for your home or office is one of the best investments you’d make. Floors, the very good ones, are after all very expensive to install. And once you have them, the smart move is to keep them in pristine shape for as long as possible. The best ways to do that are with the right maintenance techniques, especially in high-traffic areas. An all-purpose floor cleaner comes in handy when there are different floor types in the apartment. Modern, trendy apartments usually have more than one floor-type. Sometimes, the need for variety or necessity forces homeowners to install different floors for certain areas. Most times, the reasons all boil down to traffic and maintenance issues. However, choosing the best all purpose floor cleaner is not so straightforward. There are so many of them with captivating pitches. Because of that, it can be overwhelming to pick the perfect multi-surface floor cleaner. This review has pared the problem down to 10 products. These are the very best all purpose floor cleaners. Over time, they have proven their worth as far as users’ satisfaction is concerned. Safety – Safety is always an important concern since humans have to come into contact with the products. We made sure the products didn’t contain harmful and toxic chemicals such as ammonia, alkalis, phthalates, etc. Cleaners with a neutral pH made a good impression and were more likely to make the final list. Ease of use – The cleaners that made the list didn’t have unnecessary hoops to scale before they could be used. Concentrates must be easy to mix and premixed products that can be used immediately were given priority. Except in rare cases like the Hoover Cleaner, cleaners requiring specialized types of cleaning machines/equipment were dropped. These make it imperative to stick to their brands only. We wanted users to have options and not to be restricted at any point in time. Cost – In an ideal situation, the cost should not be a factor in picking the best. However, the reality is, budget constraints may force many users to avoid some products. The products in the review balanced the effectiveness of the product with the cost. In effect, we selected products that gave the best value for money. In many cases, relatively low-cost products were better than the pricier ones. It just proved you don’t have to pay an arm and a leg to get quality products. Users’ reviews – The opinions of people who bought and have used floor cleaning products played a huge role in the evaluating process. They were helpful in weeding out the very bad products so we didn’t have to waste time checking them out. And they proved useful when we had to choose between two or more products that ticked all the right boxes. Generally, floor cleaners with higher average ratings from users made the cut. Those with less than three out of five stars did not make it beyond the first round. Though you are buying a floor cleaner that is suitable for any kind of floor, it would be a great idea to know your floor type. This is important because some multi-surface floor cleaners sometimes list a few floor types you can’t use the cleaner on. Next, read the label carefully. Since you are buying online, read up about the product on the manufacturer’s website to get as much information as you can. You are looking for information on whether the cleaner is not recommended for the type of floor you have. Good floor-cleaning products would clearly state the types of floors (if there are any) you can’t use their product on. For instance, some all-purpose floor cleaners can’t be used on waxed, unsealed, porous or oil-finished wood floors. Ready-to-use vs. Concentrate: Ready-to-use floor cleaners can be used directly from the container. If time is a factor in your daily routine, these are recommended for you. With concentrates, you would have to mix the floor cleaner with a solvent. Water is the usual solvent and you must read the instructions carefully to get the right ratio of water to concentrate to arrive at the optimal cleaning solution. Not getting the ratio right can compromise the quality of your floor due to the abrasiveness of the solution. On the hand, too little concentrate would not clean the floor very well. Pro tip – test your cleaning solution on a small, discrete part of the floor to see how well it does before applying it to the whole floor. Excellent all-purpose floor cleaners must be able to spot clean and deep-clean floors. They should also be to easily deal with specific issues such as grease build up and scuff marks. Fortunately, the products in this review can do all these and much more. 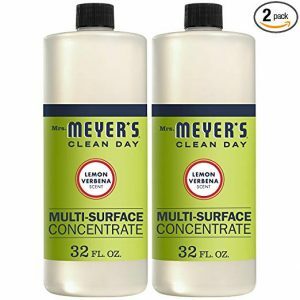 You’d love Mrs. Meyer’s Clean Day all-purpose floor cleaner for the uncompromising way it removes dirt on all types of floors while the lemon verbena scent in the cleaner leaves your home with the fresh, lingering smell of citrus. Also suitable for surfaces such as table tops, counters, walls, etc., the 32 fl oz concentrate is made from plant-derived and other carefully chosen ingredients. This makes it instantly biodegradable and leaves no harmful residues on the floor and other surfaces. This floor cleaner is free of phthalate, parabens and other toxic or harmful ingredients. 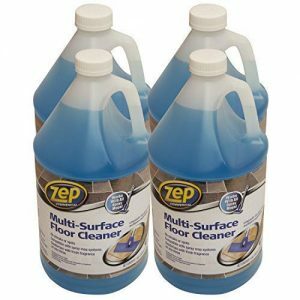 Zep Multi-Surface formulation is a ready-to-use floor cleaner that requires no mixing or addition of water. The cleaner deodorizes your floor while cleaning it at the same time. 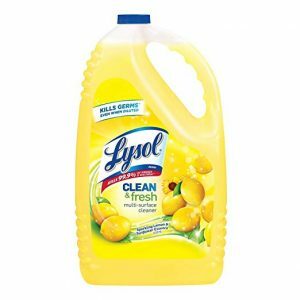 This pack of 4 containers totaling 128 ounces of cleaning solution would save you time and money as you don’t have to purchase another one for quite some time. Besides, it is compatible with all spray mops. It efficiently removes dirt, soil, stains, greases, etc, from all floor types such as vinyl, linoleum, marble, tile, stone, etc., leaving the floor with a fresh fragrance without any hint spots or streaks. Unfortunately, it is not advisable to use it on floors that require waxing and oil-finished wood floors. 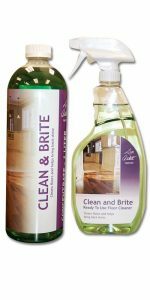 Don Aslett’s Clean and Brite Floor Cleaner comes in a 1-quart concentrated cleaner container and a 1-quart spray bottle that can be refilled and used again. The spray bottle contains a premix, ready-to-use cleaning solution. It is a pH neutral solution ensuring that as a floor cleaner, it does an excellent job without taking a toll on the glossy finish of wood floors. Other floor types such as vinyl, tile, linoleum, stone, hardwood, marble, etc, also get the benefit of its gentle effectiveness. Apart from being able to remove stains and messes easily, it also clearly improves the brightness and look of any surface it is cleaned with. So whether it is ice melt residue, tough stains and the dull residues left by other cleaners, this is your go-to all-purpose cleaner to produce the pristine floor you’d always wanted. 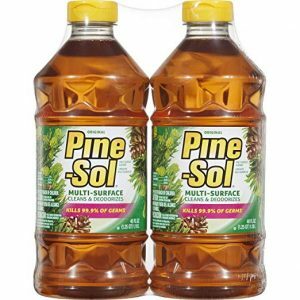 Pine-Sol is not just an all-purpose floor cleaner; you would find it handy for several other cleaning purposes around the home including certain laundry. The specially made formulation includes a disinfectant that kills 90% of germs. For tough stains, grease, dirt, grime, etc., you get a 100% wipe-out. It leaves your floor looking shiny and the home selling of classic pine. The two-bottle pack totaling 80 ounces requires no rinsing unless it is used on rubber or asphalt tile. The recommended mix is a quarter cup per gallon of water. But a fuller strength is advisable for tougher stains. 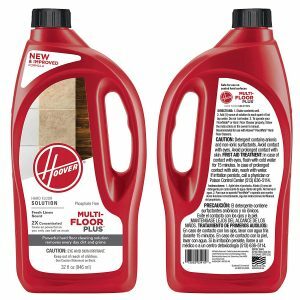 This multi-floor cleaner is specially formulated for laminate and wood floors because it doesn’t remove the wood finish or dry out the wood after some time. It contains a unique additive, PS3: a triple action poly-shield that ensures wood and laminate floor are cleaned without leaving unseemly streaks, prevents soil from attaching to floors, or leave residues that dull the glossy finished. 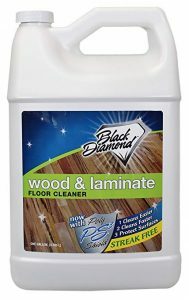 Black Diamond Wood & Floor Cleaner is also suitable for cleaning all types of surfaces such as vinyl, tile, acacia, bamboo and engineered floors. The biodegradable cleaning formulation can be used directly from the container without mixing it with water. Simply apply it to the surface, then mop and dry it to get a clean, fresh-scenting floor. The Hoover Multi-floor cleaner works excellently with an all-purpose floor cleaning machine especially if you want to avoid leaving streaks or a film of cleaning solution on the floor. To be clear though, you could also use a traditional mop with a bucket and get the same results. The concentrated cleaning detergent removes everyday dirt and sticky messes easily. Even grouts would come out sparkling clean. And of course, there is nothing to beat that clean linen scent it leaves behind after cleaning the stains and dirt on your vinyl, ceramic tile, marble, sealed hardwood, and laminate floor surfaces. Simply dilute 1 ounce of the solution in a quart of hot water to get the optimal cleaning solution. The product is very safe to use since it is free of harmful chemicals such as phosphate. 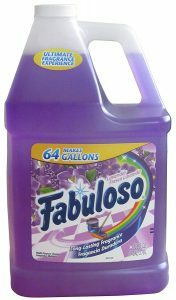 The 128 fl oz Fabuloso Multiple surface cleaner is capable of giving 64 gallons of cleaning fluid for tile, wood, marble, vinyl, and stone floors. The lavender-scented cleaner cleans deep for grease, soils, stubborn stains, and other dirt. Though it comes in several sizes, this 3.8L container is a favorite because it saves a lot of money and lasts a long time no matter your floor size or space. Fabuloso is formulated with a neutral pH making it a safe product to use even with the kids around. The presence of Glutaraldehyde, though, precludes the addition of chlorine to avoid irritating fumes. 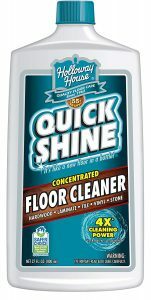 Quik Shine Concentrated Multi-Surface cleaner is the product of choice if you want a multi-purpose floor cleaner that cleans naturally without harsh alkali or ammonia. Whether it is vinyl, laminate, tile hardwood or stone flooring, it would remove dirt, stains, messes and scuff marks. You don’t have to rinse it out and it leaves no streaks. And like the best floor cleaners, you are left with a fresh scent after cleaning the floor. You can get up to 6 gallons from the 27-ounce bottle. That is a great money-saver from a product that has the seal of approval from the EPA/Safer Choice Program safe chemistry standards. Pledge Multi-Surface floor cleaner is an awesome product that you simply squirt and mop with no rinsing required. You are guaranteed a clean and shiny floor at the end of your cleaning chore. With this product, you don’t have to bother about the dreaded wax-stripping you get in other products. In effect, there is no need to spend the whole re-waxing your floor or applying acrylic. It is a safe, non-toxic formulation that makes the floor surface very nice to walk on if you love walking around barefooted. The smell is great too. But if you have an accumulation of grime from using bad products in the past, it is recommended you strip the floor first. Then you are good to go. With this Lysol Clean & Fresh cleaner, you get an all-purpose cleaner suitable for all types of floors and a very effective disinfectant for the price of one. For easy spot cleaning of difficult stains and grime, simply pour the solution directly on the offending areas and scrub it clean. For the whole floor, dilute it with water and it’d get the job done without losing any of its effectiveness. As an all-purpose floor cleaner, it is suitable for hard, non-porous surfaces in the kitchen, bathroom, living room and other areas in the house. It delivers long-lasting freshness and your house would smell great after using it. This review was aimed at ensuring that picking the best all-purpose floor cleaner is not a task that would consume more of your precious time than is necessary. Hopefully, the review succeeded in doing that and providing all the information and tips you might need in picking the most appropriate floor cleaner for your home or office. The ten all-purpose floor cleaners in this review are guaranteed to give you the best value for your money. You simply can’t go wrong with any of them.